For almost 15 years, the EIT camera on board SOHO transmitted a picture of the solar corona every 12 minutes, providing ground-breaking observations of the Sun that changed our perception and understanding of our star. After a remarkable career, this instrument has now eased into semi-retirement. Although no longer as active as during its heyday, EIT will still provide snapshots of the Sun - at a more leisurely pace. Launched in late 1995 and still in operation, the SOHO mission has revolutionised the way we all view the Sun. A collaboration between ESA and NASA, SOHO carries a suite of 12 instruments which have been enjoying an uninterrupted view of our parent star for almost one and a half decades. Observing the Sun from outer space, SOHO can probe wavelengths that are absorbed by the Earth's atmosphere, such as the ultraviolet (UV). 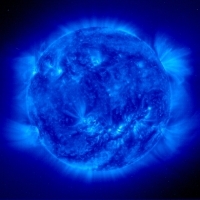 It thereby allows astronomers to study the corona, the Sun's outer atmosphere, which has a typical temperature of about one million Kelvin and thus shines brightly in the UV. 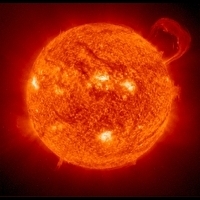 Of the suite of instruments on board, the Extreme ultraviolet Imaging Telescope (EIT) is probably SOHO's most popular workhorse, having taken over 500 000 snapshots of the Sun. A European-led instrument, EIT was realised by a consortium of laboratories and institutes in France, Belgium and the US. "Designing and building it was extremely complex, especially because the resources were scarce," explains Jean-Pierre Delaboudinière, the Principal Investigator for EIT who led the project from inception until 2005 at the Institut d'Astrophysique Spatiale in Orsay, France. "Nevertheless, we managed to produce a great instrument: planned to last only a couple of years, it has worked exceptionally well for almost 15 years," he adds. "EIT wasn't meant to be the extraordinary instrument it then became," notes Bernhard Fleck, ESA's SOHO Project Scientist. In fact, this telescope was originally intended as a mere viewfinder, to set the context for data collected by the two spectrographs. As such, EIT was supposed to take images of the corona twice a day. "Only after having seen the Sun with EIT did we fully realise the enormous scientific potential of the instrument. This is why we decided to increase the cadence of the snapshots to one every 12 minutes," Delaboudinière adds. Thanks to such frequent sampling, EIT revealed the dynamic nature of the solar corona, which appears to be constantly changing. 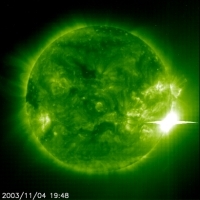 EIT’s observations have strongly influenced the evolution of solar physics, paving the way for NASA's Solar Dynamics Observatory (SDO), launched in early 2010. Thanks to substantial improvements in technology, the AIA instrument on board SDO is able to monitor the Sun at much higher cadence and much greater resolution than SOHO's EIT. After a few months of joint operations to cross-calibrate the instruments, it was time for EIT to pass the baton to its successor. 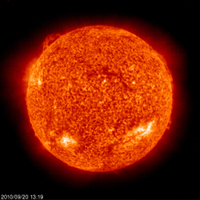 Since 1 August 2010, EIT has reverted back to its original observing mode, taking images of the Sun only twice per day. "EIT has been hugely successful, producing a wealth of results which could not have been achieved without it," says Frédéric Auchère from the Institut d'Astrophysique Spatiale in Orsay, France, the current EIT Principal Investigator. "Originally intended only as a support instrument, it turned out to be one of the most productive aboard SOHO: a winning underdog," he adds. In fact, over 400 refereed publications and doctoral theses arose from data gathered by EIT alone, leading to a vast number of 'first' discoveries. "It was the first instrument to routinely provide daily images of the Sun's lower corona, thus allowing us to identify large-scale coronal structures and study their evolution," says Daniel Müller, ESA's Deputy Project Scientist for SOHO. Another great finding of EIT was the discovery of travelling waves in the corona, which propagate at speeds of a few hundred kilometres per second — a global phenomenon that had never been observed in the pre-SOHO era. Having almost continuous monitoring of the corona was crucial to detecting waves that travel so fast that they can propagate through the entire corona in less than an hour. "At first we detected a few spectacular waves. They were interesting because of their extreme speed, and most importantly because they affected the entire Sun, so we decided to conduct a systematic survey of such waves," explains Delaboudinière. These waves are now referred to as 'EIT waves' in the scientific literature. 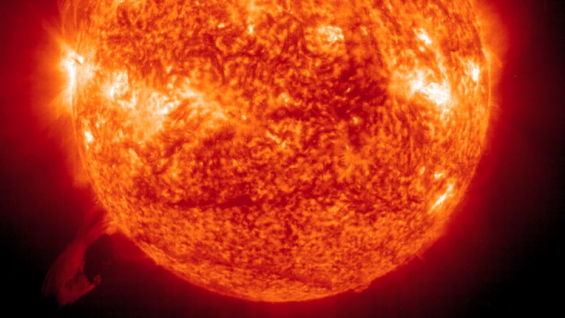 Thanks to EIT, astronomers figured out that these waves are related to Coronal Mass Ejections (CME), one of the most spectacular, transient phenomena taking place in the Sun. 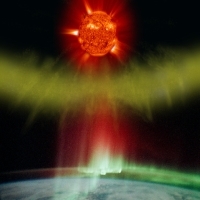 CMEs are colossal eruptions during which enormous amounts of gas are released from the Sun into outer space. 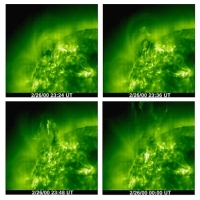 The key feature of EIT is its ability to follow the temporal evolution of solar events: this unprecedented 'cinematography' of the Sun allowed solar physicists to tackle its phenomena from a global perspective. "It might sound subtle, but there is a substantial difference between a sitting eagle and a flying one," says Fleck. "You have to see an eagle fly to understand what an eagle is. This is exactly how we felt when we first watched the amazing footage collected by EIT." EIT has also captured the imagination of the general public and shaped the way many people see the star that provides us with light and heat. Its pictures have been featured in countless articles and EIT movies have been downloaded millions of times from the SOHO website. "EIT has certainly done much more than we expected," says Auchère. 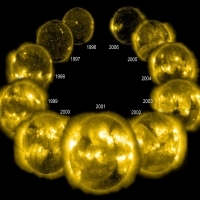 "It has monitored the Sun over an entire, 11-year solar cycle, and has even witnessed a period of unusually intense activity in October 2003," he adds. Now time has come for retirement. Or, better, only a semi-retirement. "EIT is still up and running, and keeps taking, every day, two of the snapshots that made it so famous," Fleck concludes. 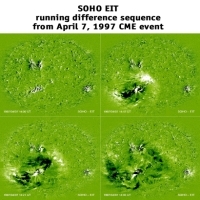 SOHO (SOlar Heliospheric Observatory) is a project of international cooperation between ESA and NASA to study the Sun, from its deep core, through its outer atmosphere — the corona — and the domain of the solar wind, out to a distance ten times beyond the Earth's orbit. SOHO monitors the Sun constantly from a privileged point in the Sun-Earth system, the so-called First Lagrangian Point (L1). Located between the two celestial bodies, at a distance of about 1.5 kilometres from the Earth, SOHO enjoys an uninterrupted view of the Sun — something impossible to achieve from a ground-based observatory due to our planet's rotation. The Extreme ultraviolet Imaging Telescope (EIT) images the Sun's corona in four extreme-ultraviolet (EUV) filters, centred at wavelengths of 171, 195, 284 and 304 Ångström, respectively. The first three filters probe radiation emitted by highly ionised atoms of iron, corresponding to temperatures in the range 1-2 million Kelvin, whereas the last one is sensitive to light emitted by ionised helium, corresponding to significantly lower temperatures (60,000-80,000 Kelvin). EIT was designed and built in France under the leadership of Jean-Pierre Delaboudinière at the Institut d'Astrophysique Spatiale (IAS) in Orsay, France. The EUV optics, including their multilayer coatings, were provided by the Institut d'Optique Théorique et Appliquée (IOTA; Orsay, France), the telescope structure was built by Centre Spatiale de Liège (CSL) in Belgium, while the camera and electronics were contributed by the US Naval Research Laboratory (NRL, Washington DC). Other institutions belonging to the EIT Consortium are the Lockheed Martin Solar and Astrophysics Laboratory (LMSAL; Palo Alto CA, USA), the NASA Goddard Space Flight Center (GSFC; Greenbelt MD, USA), the Observatoire Royale de Belgique (ORB; Bruxelles, Belgium) and the Laboratoire d'Astronomie Spatiale (LAS; Marseilles, France).